Chaska is a southwestern Twin City suburb that values its historical past as well as its developing future. The city of Chaska places a strong emphasis on parks and recreation as a tool to build a stronger community. While maintaining its rich history, the city has made many improvements towards a small town of quality. With only a short drive to downtown Minneapolis, Chaska is the perfect location for you and your family. Chaska offers a great selection of homes for all buyers. Throughout many neighborhoods, you will find cozy bungalows and cottages but most commonly you will find traditional house plans with classical columns and front covered entries. In 2009, Chaska’s estimated median house value was $242,035 but has increased in recent years. North West of Pioneer trail, you will find more luxurious homes including those located in the pristine development of Chevalle, 300 acre conservation development, with homes priced from $300,000 to $2 million. Chaska is approximately 14.3 square miles with both land and water. Downtown Chaska lies on the beautiful Minnesota River with plenty of scenic overviews. 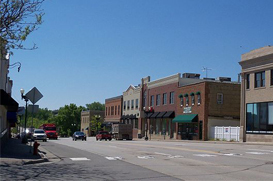 According to the U.S. 2010 Census, about 23,770 residents live in the City of Chaska. From the start, Chaska has done well managing its resources. In the mid 1800’s, an abundance of high quality clay was discovered. In time, Chaska became a successful brick manufacturing center. The bricks were shipped by river to expanding cities such as St. Paul. Today, Chaska is home to numerous industrial and manufacturing plants including TPI specialties. Downtown Chaska is a popular spot to shop, dine, and relax while enjoying the pleasant view of the Minnesota River. The first natives of Chaska are believed to be Mound Builders. These ancient inhabitants built hill like mounds, similar to the one located in Chaska City Square, to mark their community and for religious and burial ceremonies. Soon after, Sioux Indians settled on the land which was known as the Big Woods. The river was a great resource for trading back in the late 1700’s. Many fur traders traveled the river to trade at the Chaska trading post which was established by Jean-Baptiste Faribault. Chaska was incorporated as a village in 1871 and later as a city in 1891. Eastern Carver County School District 112 serves the city of Chaska along with neighboring city Chanhassen. Within this district, there are seven elementary schools, three middle schools, and two high schools. According to the Washington Post, both Chaska and Chanhassen high school are among the top 10 percent of high schools in America. Many families are satisfied with the districts value in education and efforts to personalize every students learning experience. The main routes serving the city of Chaska are U.S. Highway 12, Minnesota State Highway 41, and Chaska Boulevard (Old Highway 212).